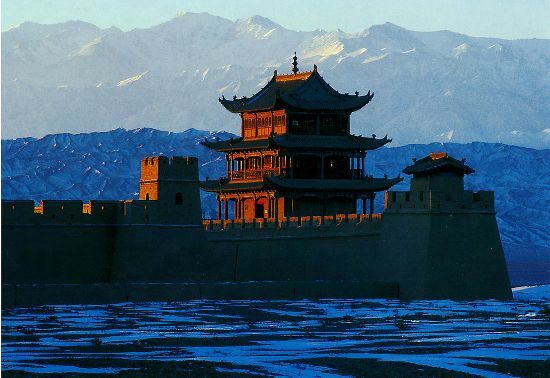 Jiayu Pass (万里长城－嘉峪关) stands in the southwest section of the city of Jiayuguan in Gansu Province. The snow-covered Qilian Mountains spread for hundreds of miles to the south, and the Dragon's Head (Longshou) and the Horse's Mane (Mazong) mountains rise to its north. The walls on both sides of the pass extend across the desert to join the mountains. It was a strategic passageway on the route to the western regions (west of China's Yumen Pass, including what is today's Xinjiang and Central Asia). The existing building was constructed in 1372, with two layers of walls dividing it into outer and inner sections. The outer wall was made of mud except for the western section, which was built with bricks. The double walls indicate the important strategic position of this pass. Jiayu Pass is the western starting point of the existing Great Wall, which crosses deserts and follows mountain ridges for more than five thousand kilometers until it reaches the sea coast in eastern Liaoning Province. 1. Visitors may go to Jiayu Pass by either plane or train from Lanzhou and stay at local hotels.